BEGIN WITH A PIECE OF PAPER It took only a few moments. Just that quickly, a virtual jungle of twisting microscopic paper fibers ensnarled the imaginations of Jacqueline Benard and Galina Mihaleva. But it took more than two years and a synthesis of artistic and technical expertise from across an entire university to bring the products of their imagination to life on stage. The result was Paper Interiors, a technology-infused dance performance that set tradition on its ear. Benard and Mihaleva are costume designers for the Department of Dance in the Herberger College of Fine Arts. 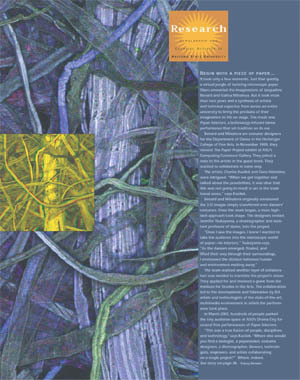 In November 1999, they viewed The Paper Project exhibit at ASUs Computing Commons Gallery. They jotted a note to the artists in the guest book. They wanted to collaborate in some way. The artists, Charles Kazilek and Gene Valentine, were intrigued. When we got together and talked about the possibilities, it was clear that this was not going to result in art in the traditional sense, says Kazilek. Benard and Mihaleva originally envisioned the 3-D images simply transferred onto dancers costumes. Once the work began, a more high-tech approach took shape. The designers invited Jennifer Tsukayama, a choreographer and assistant professor of dance, into the project. Once I saw the images, I knew I wanted to take the audience into the microscopic world of paperits interiors, Tsukayama says. As the dancers emerged, floated, and lifted their way through their surroundings, I envisioned the division between human and environment melting away. The team realized another layer of collaborators was needed to translate the projects vision. They applied for and received a grant from the Institute for Studies in the Arts. The collaboration led to the development and fabrication by ISA artists and technologists of the state-of-the-art, multimedia environment in which the performance took place. 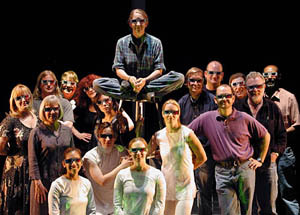 In March 2002, hundreds of people packed the tiny audience space at ASUs Drama City for several free performances of Paper Interiors. This was a true fusion of people, disciplines, and technology, says Kazilek. Where else would you find a biologist, a papermaker, costume designers, a choreographer, dancers, technologists, engineers, and artists collaborating on a single project? Where, indeed.